NIVEA In-Shower Rich Body Lotion is an in-shower body lotion that leaves a nourishing and caring coating on the skin’s surface. The non-greasy formula absorbs immediately into the skin. 50mL Retailer Stockists: Discount Department Stores & Selected Pharmacies. I received a few samples of this product and was keen to give it a try: I have dry skin, but body lotion is my least favourite part of my daily routine and I often skip it when I can, so this was a great addition to my shower routine. The lotion was thick and had a lovely fragrance typical of Nivea products. It slipped onto my skin and felt pleasant on application. It washed off easily and left my skin feeling soft, smooth and moisturised after the shower. The best part about it was that once I dried off with a towel I could slip straight into my clothes without the sticky residue that can often accompany other body lotions. Be careful not to spill any - it can make the floor pretty slippy. Anyone who is time poor but doesn't want to skip on moisturising. I purchased this after discovering that in-shower moisturisers existed! I am one of those people who hates the feel of using lotion or moisturiser after a shower, as I'm always trying to get dressed in a rush and hate that sticky, clingy feeling. I loved it so much that when I was only half-way through the bottle, I purchased a back-up while half price at Priceline! Has that classic Nivea scent. A thick, white cream that spreads easily over skin. I find if you use it as the very last step in your shower routine, and only lightly rinse off as suggested, the lotion works incredibly well. It leaves my skin soft and smooth, my husband reckons he notices the difference. It's obviously not as effective as moisturisers applied after the shower as far as longevity, but I find for my relatively normal skin, every second day use keeps those flaky shins away. Use as last step in shower routine and only quickly rinse. Lazy people who want to moisturise body skin quickly and effectively! I really liked the idea of applying moisturiser in the shower. Sometimes I can be lazy when it comes to skincare, so this seemed like the perfect solution. I do like this lotion, it smells good and I nearly always remembered to use it in the shower. While it did help somewhat, I don't think it's as effective as normal moisturisers. I think if the formula could be perfected and work as well as normal moisturisers, this product would be a complete game-changer. I do still like it though, I'm more likely to remember to use this and some moisturiser is better than none. The bottle says to avoid putting it on your feet, but if you're careful about it and rinse them completely it's quite effective for moisturising feet. People like me who are lazy and/or forget to moisturise, people who don't have time to use normal moisturiser. The concept of an in shower lotion was a bit confusing for me. I understand we all want to be efficient and use our time effectively but I find that using a lotion in the shower defeats the purpose. I wanted it to work but by the time I even used the product on my body I felt like the water just washed it off before my skin was able to receive any benefits. It is creamy and hydrating and it has that classic Nivea scent but it just did not work for me. I used it all over my body and I even thought it was a good idea to use it as a shaving cream of some sort. I feel like it temporarily kept my skin hydrated and soft but once it was washed off so did the hydration. I guess I see it more as a cream body wash but with less hydration. Hydration for the time poor! Do you hate that sticky feeling you have on your entire body when you get out of the shower, dry yourself THEN moisturise? Well my friend, that time in your life is over. I have always hated having to wait for my skin to dry before getting dressed after slathering myself in creams, so this product has it's own special place in my shower, I use it once a week, twice in winter or when Im feeling particularly dry. Be super careful of the slippery surfaces when you are in the shower after you have rinsed off, the product tends to leave a film. People who do not like to wait for their skin to dry after moisturising. The Nivea in shower moisturiser has been very handy for me. I'm awful at remembering to moisturise my body daily so picked this up at the start of winter in the hopes it would help. I was skeptical at first but after a couple of uses I really began to see the benefit of this product. It's a lovely creamy moisturiser with no strong discernible odour, you rub it on in the shower and let it soak in a bit and then simply rinse off. Its amazing to how this manages to hydrate my skin when usually showers dehydrate my skin considerably and for at least a day afterwards my skin feels soft and supple. It's a fool-proof beneficial product, my only critique would be to make the bottles more manageable for wet hands! Leave on for a few minutes! Anyone trying to get some extra hydration in their skin! I find this a good back up to shave gel, the formula is quite thick and can be greasy however it does give a smooth area for shaving. The shower cream smells lovely and great for very dry areas such as knees, back and elbow, which are hard to get to. Use a little bit, watch the shower floor and dont get it on your face, it makes it really oily. NIVEA In-Shower Rich Body Lotion might sound like a life saver for dry skin condition. However, this product is not meant for me. The texture is a bit thick. After smoothing on my clean wet skin, I rinsed it off. However, it leaves quite a thick layer of lotion that can't be washed off. I feel it kind of on the heavier side. The slick layer of moisturiser makes me feel uncomfortable. Nevertheless, after towel off my skin dry, I no longer feel it. I would prefer normal, out of shower type of lotion. I bought this on a whim to try, and I'm happy that I did. I take quite hot showers and find that my skin is obviously dry following the hot water. I like that you apply this lotion while you're in the shower, and the bonus point is that you don't have to wait too long before washing off the lotion. The results are immediate once you step out of the shower - you're rewarded with smooth silky skin. However, this only lasts the night. In the morning, I find that my skin returns back to normal and the silky smooth feeling is gone. Perhaps it is better to still moisturise with body lotion after the shower. Still, this in-shower lotion is better than nothing and I'd recommend it for people who find it a trouble to moisturise after showers. I just love this product. I'm a person who really hates applying lotion because I don't like the sticky feeling of it and waiting for it to dry. That's why I love using this lotion. You apply it in the shower and rinse it out. It makes my skin so soft and smooth. I love using this when my skin is very dry and also before and after sunbathing when it's important to have soft skin. The smell of this is my favorite, it smells very similar to most Nivea products, including the body cream I love. People who don't like using regular lotion. I love love love this moisturiser. It is super easy to use and convenient. Pop it on while you're in the shower and continue with your normal routine before you wash off and you're left with soft and subtle skin. It makes my skin more moisturised than any other moisturiser I have ever used and doesn't leave an stickiness on my skin like others I've tried. I was a little sceptical about an in shower moisturiser but I have no regrets! This is perfect! The product itself is nice to use, it doesn't feel oily/greasy on your skin at all, but I didn't really feel that this was good enough for me not to then moisturise after my shower. I applied this product as per the instructions and did not use a loofah or sponge, but I still moisturise afterwards. I feel that my body might get double benefit until I use this up, but I wouldn't rush out to buy again. Continue to use your normal moisturiser after you shower. Those who do not have time to moisturise and want to feel as though they have done something. This moisturizer is pretty good. I often forget to moisturize when I'm in a rush so I love how I can just apply this like a shower gel and then just go and get ready. It doesn't have a fragrance, which I prefer, as I like my everyday body products to just make my skin feel very soft and clean and not have an overpowering scent. It does say that it's for very dry skin, however I don't think it makes my skin noticeably soft, which is pretty disappointing. Good to use in winter as you can stay in a warm shower and moisturize, or before work if you need to shorten your skincare routine. Most days I would opt for a moisturizer with a much thicker consistency as this isn't the best if you have dry skin. I'm really bad at keeping up with a moisturizing regime, this stuff helps me "kill two birds with one stone".. I will be continuing to purchase this stuff, it's excellent value for the price. I love nivea products, this is definitely one of my new favourites in the same pile as the Nivea Creme, just more convenient. At first I was very skeptical when I heard about this stuff - lotion in the shower? Whaaaa? - but no, it does actually fo what it claims. It's very good despite the fact you wash it off. Very easy to use and well, its something to look forward to every shower! I usually stop the water and really massage this stuff in before washing it off. I'm not too "quick" at washing it off as the instructions suggest, I like to give it time to do the job. People, like me, who quite often don't get around to moisturizing. OMG I noticed such a huge difference when i first started using this product. My whole family used this and we loved it so much we had to go buy more within a short time. It is at an affordable. I bought mine from Kmart however we couldnt buy anymore after afew months of using it because there was none in stock anymore which really sucked. My favourite in body shower lotion was the Milk and honey, because i just loved the smell of it and applying it on my skin lasted even longer! Strange but i also applied this on my pimples of my face and noticed that it completely disappeared within 24 hours or less. This is one my favs but sad that i hardly see them in store as much! Every now and again there is a product you try just for the novelty factor and end up becoming an unsuspecting fan. This is one of those products. The bottle has the lid to the bottom, which works, but is still awkward so handle in the shower. I think short of a pump action pack, which I am not sure would be possible with this product, it works. This is a milky body lotion which is applied in the shower, and you rinse off, then once out towel dry. Compared to all the other smells that are going on in a shower, this is a subtle, nutty scent, and when applied almost feels more like hybrid between a body oil and a body lotion. I don't need much to ensure that my legs, arms and torso get a little bit of tlc. I then rinse off just before I get out of the shower. When I dry myself, there is no residue on the towel, and my skin felt soft and moisturized from the first use. An additional bonus is that I often get dry itchy skin after getting out of the shower, and this extra moisturizing boost helps keep that under control. For a slightly more off-beat input from my boyfriend who regularly swims, he didn't realize it wasn't soap and sang its praises of how it got rid of that chlorine smell . He also repeatedly made me feel how 'not dry-ed out from the pool' it made his skin. I guess that's a thumbs up from him as well. Don't go overboard, but use regularly to get the best results. Those who hate waiting for their moisturizer to settle after a shower. This product for me not so much a time saver, but is great for Winter to make sure I am moisturized without having to freeze my toosh off. In winter I definitely give moisturizing the flick and opt to get straight into my jammies or trackies as I cannot tolerate the cold. To be in the shower, steam filled and moisturizing is great. In terms of time saving, well I spend this time in the shower rather than out of it, so sort of, but any excuse to be in the shower longer really is a winner in my eyes. The main catch for me is that it can make the shower floor slippery so I feel like I spend the time saved cleaning the shower, but I guess I can do that in my trackies. I think avoid if you have little kids that could use your shower, as it really does make the tiles slippery. I love this product! It is an absolute time saver! I love anything that means saving time and making life easier. I hate having to put moisturiser on my whole body all the time and I always forget to do it or can't be bothered, and it's annoying to stand in the cold after a shower trying to wait for moisturiser to soak into your skin so you can put clothes on and this product helps with exactly that. Just another quick step to add to your shower routine for perfectly moisturised skin. The product smells amazing, like all Nivea products it has that unique smell. It is soft and smooth and feels like the product soaks right into your skin and doesn't leave a sticky wet residue on your skin after. I hate moisturisers that leave you feeling greasy or oily and this one definitely doesn't do that. My skin always feels great and more hydrated after using this product. Negatives about the product are definitely the packaging, it is a hard plastic and small opening making it very hard to squeeze the product out, and when I get towards the end of the bottle it gets worse, I end up having to unscrew the lid each use. Be careful as it may make shower floor slippery. People looking for a time saver. People who forget to moisturise because it's too hard. I generally have relatively dry skin due to fake tanning a lot! So I rely on Moisturisers heavily. I find this product very useful and it does do exactly what it says it should, I recommend it for those who are time poor or like me just simply can't be bothered going through a full moisterising routine after showering. Relatively easy to use, squeeze out a handful while in the shower and lather over your body before rinsing under the shower and patting dry once out. One downside is I find the bottle is made of very rigid plastic and the lotion is quite thick, meaning it can be difficult to squeeze product out of the bottle which makes it difficult when it becomes less than half full, can get frustrating. It doesn't leave my skin feeling sticky like other moisturisers do which is a bonus but also does mean it isn't the same level of moisture as a normal lotion so i still do apply my normal moisturiser from time to time as a top up. You'd be surprised how little you need to squeeze out to apply all over the body. Also only pat yourself dry when out of the shower, leaving as much product there to sink in. Time poor or too lazy to go through an out of shower moisturizing routine! More for summer than winter, but still a winner, baby, that’s no lie! A new more convenient way to moisturise. Now you can quickly moisturise before you get out of the shower. 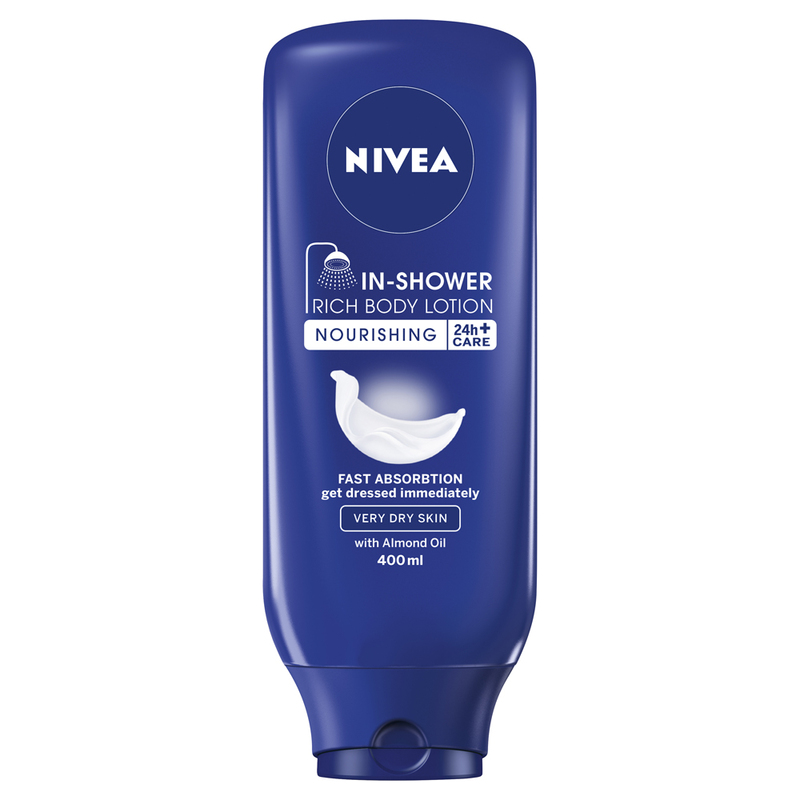 NIVEA In-Shower Rich Body Lotion immediately absorbs into the skin, leaving a nourishing and caring coating on the skin’s surface to give your skin the moisture it needs. Gone are the days where you need to wait around for your skin to absorb moisturiser after showering. Our non-greasy formula means you can slip clothes straight on and carry on with your day. The product: Restores and replenishes lost moisture; Enhances the skin’s natural protective layer; Prevents further moisture loss; Can be applied in the shower. NIVEA In-shower Body Lotions are activated by water and immediately absorb into the skin. It leaves a nourishing and caring film on the skin surface without a sticky feeling. This is a rather large shower product. It’s a massive bottle in the familiar Nivea dark blue and is plastic. I like that it’s gravity fed and it looks like it’s a press to flip top cap on the bottom where the base tapers to the press flip top however that is not the case. You have to lever the cap open. I suspect this will be annoying if your hands are slippery (I foresee an accident)! The bottle has elegant white writing on the front and it’s otherwise very sleek. All in all, you get 400ml of product and I purchased mine for $7.99. This is something I’ve been wanting to try for a while, ever since I tried a natural (and absolutely amazing) version some months ago. The directions on the back of the bottle are quite simple. For best results: Cleanse with shower gel as usual and rinse off; Stepping back from the shower stream, apply a generous amount of NIVEA In-Shower Body Lotion; The caring formula will immediately be absorbed by your skin, ready to be rinsed; Dry off and you can get dressed immediately! (Please note these instructions came directly from the makers). So I used a bit of logic and was not going to apply the product whilst still under water; that seemed wasteful. I washed, then turned the spigot off. I squirted approximately seventy cents worth into my palm and distributed between both hands; this was enough to cover both arms, my torso and stomach. A second application took care of the bottom half. I stood for a couple of moments (literally enough time to recap the bottle, put it on the shelf, ensure the cream was evenly distributed, think about the time and then say ‘bugger it) and then rinsed off. The shower cream rinsed off easily and my skin felt slick. I was conscious of wiping the product off my skin when I was drying off, so I dried carefully (which to be honest was a bit annoying for winter). When dry my skin felt moisturised to the touch. In the morning however my skin didn’t feel as moisturised. The scent on application is not overpowering (which is great as I am not a fan of the artificial almond) and the scent does not stay with you overnight. I think the product is great but not amazing and for my skin it would probably be better used for in summer when it’s a bit more humid rather than in winter when I really need more moisture. Definitely turn the shower off when you are applying, which is contrary to the instructions Nivea provides you (otherwise you really are washing product down the drain before it even makes it onto your skin). Be careful with the bottle as your hands will be slippery. A little goes a long way so start in sections. I think this product is great for dry skin however I like to be really moisturised overnight so I don’t have to repeat in the morning. That’s just my thing and not a reflection on the product. I do recommend this product and I will be using it again, but I will save it for summer for when the humidity strikes and when I will be prone to sweating my moisturiser off! Winning products, as voted by you! To help you on your way to silky smooth skin!  WIN: Products tested by our Trial Team!